Halloween is here and you can treat yourself with 50 Free Spins on Gonzo's Quest at the NetEntertainment powered ComeOn Casino! 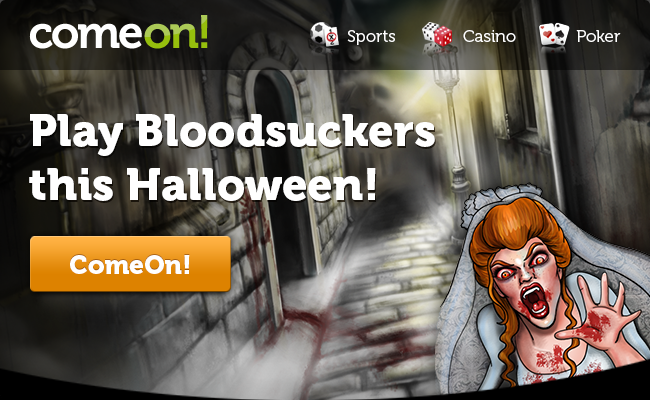 Happy Halloween from ComeOn Casino! Halloween is here and you can treat yourself with 50 free spins on Gonzo's Quest. Read all about it here! Try to win some cash on the video slot that is a firm favourite at ComeOn Casino called Bloodsukkers. Simply perfect for getting you into the Halloween spirit! This is one of thei games which allows you to bet anything up to 500 Euros per spin, making for potentially HUGE WINS of around 1,500,000 Euros on a single spin! How to win 50 free spins on Gonzo's Quest this Halloween: No tricks, just treats! The top 10 players who bet the most on Bloodsukkers before the end of Thursday 1st November 23:59 CET, will win 50 Free Spins on Gonzo's Quest! Winners will have their 50 free spins on Gonzo's Quest in their accounts on Friday 2nd November at 19:00 CET. The 50 free spins will expire on 10th November at 23:59 CET.